You may not be a billionaire…but you can still act like one when it comes to political giving. According to Forbes magazine’s “The World’s Billionaires” list, the Bay Area in California is home to 66 billionaires – more than any other part of the country. 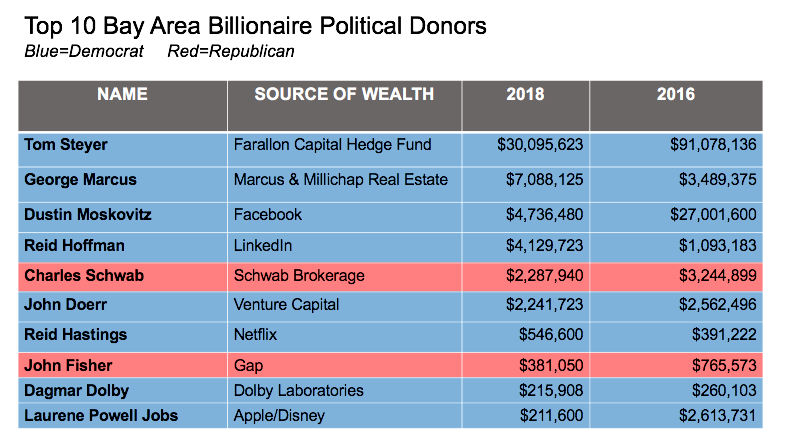 ‍Surprisingly, 40% of these billionaires haven’t donated to a federal political campaign in 2018 (and 60% have donated less than $10,000). Blue Impact Network compiled a list of the 66 billionaires in the Bay Area and cross-referenced it with campaign finance data from OpenSecrets.org. The numbers show a significant drop in political donations from this group compared to the 2016 election cycle. It’s important to note that these figures don’t account for so-called “soft money” donations (money that is not earmarked for a specific candidate), but the disparity in political giving between 2016 and 2018 is still hard to fathom. 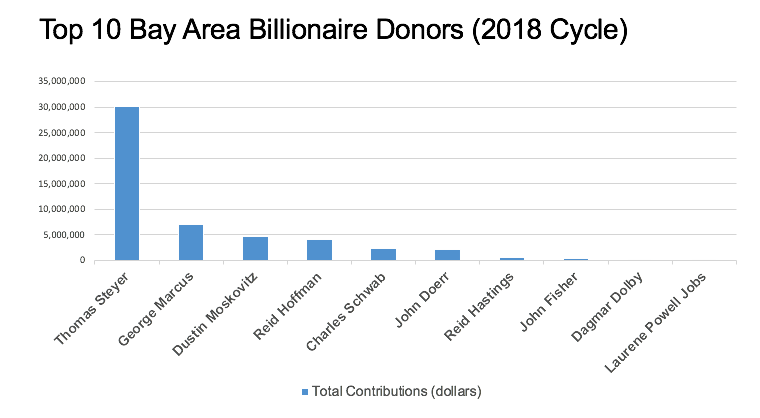 The chart below lists the Top 10 Bay Area billionaire political donors. CLICK HERE to peruse the entire list. We can’t count on a “Blue Wave” to save our democracy in 2018. Billionaire donors aren’t going to solve the problem, either. Don't wait for the billionaires to act. Blue Impact Network has identified the most important under-the-radar political investments of 2018. CLICK HERE to donate to Democrats running in critical Congressional races, or use the menu at the top of the page to donate to down-ballot campaigns and programs in key states that can swing political momentum for the next decade.